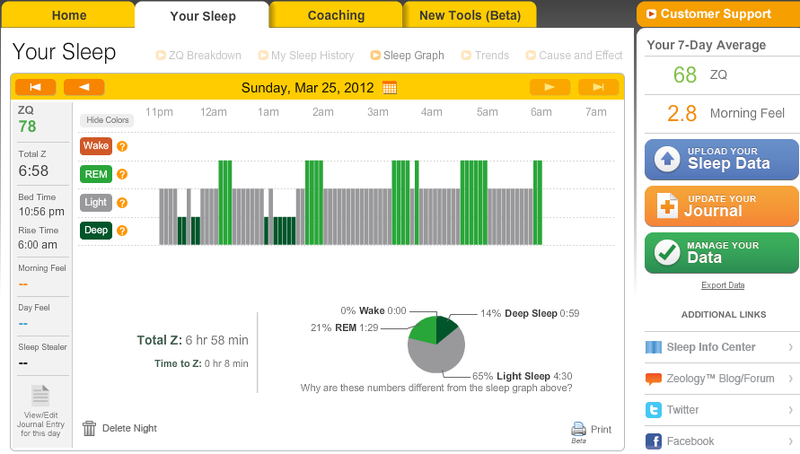 WakeMate measures the quality of a person’s sleep based on actigraphy. It consists of a small accelerometer placed inside a soft elasticated wristband. The device is first charged for a few hours usings a mini-USB adapter. One charge lasts for about two nights of use if the device is switched off between uses. 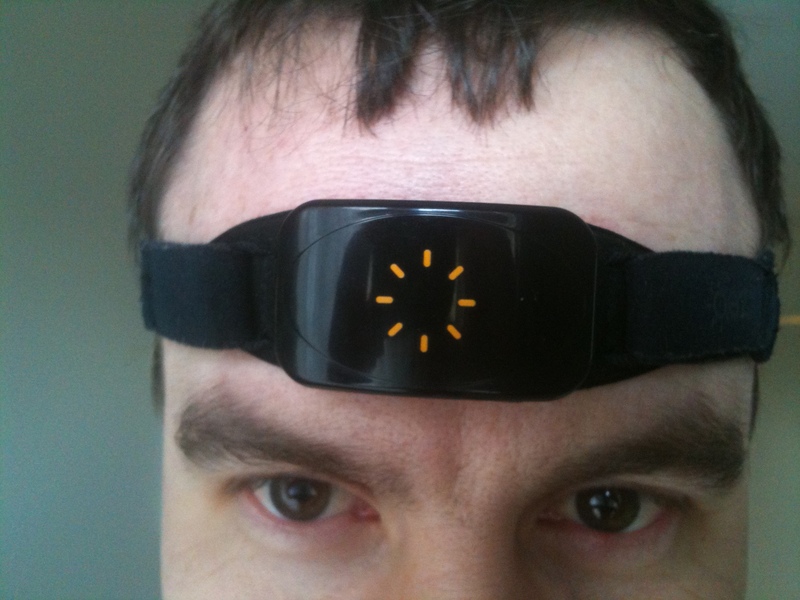 Before going to sleep, the user activates a small switch inside the unit tucked into the wristband and an LED appears. Then a custom app is activated–the device is factory set to work with only one mobile architecture, either Apple iOS, Android, or Blackberry. 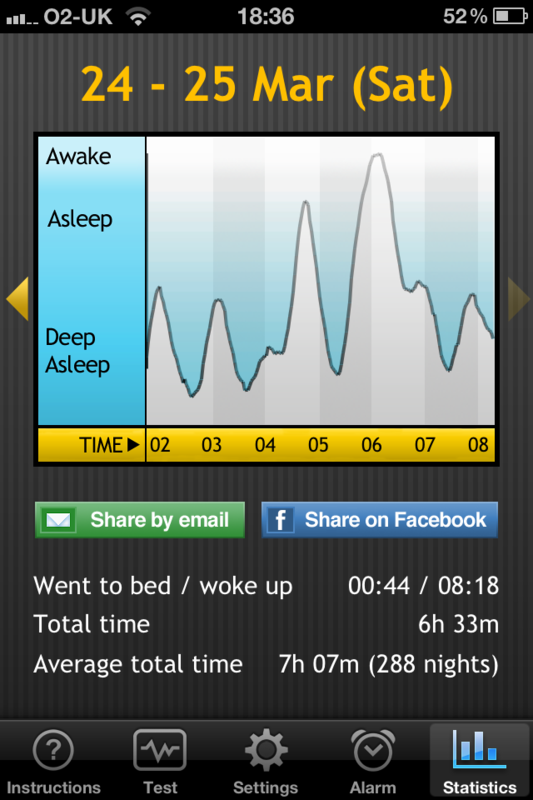 The user then makes sure the app has a bluetooth connection to the wristband and sets the desired wake time. As with other sleep monitoring devices, the software will sound an alarm in advance of the desired wake time if it detects the user is in a light sleep phase so that they are not accidentally woken from a deep sleep leaving them more groggy upon waking. The device and software are somewhat complicated to use because of the need to switch on and off, charge often, and the multiple button presses to activate the software and ensure a bluetooth connection is active. 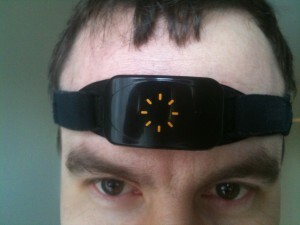 This is one of the least expensive lifelogging devices available at time of writing at approximately US$60. 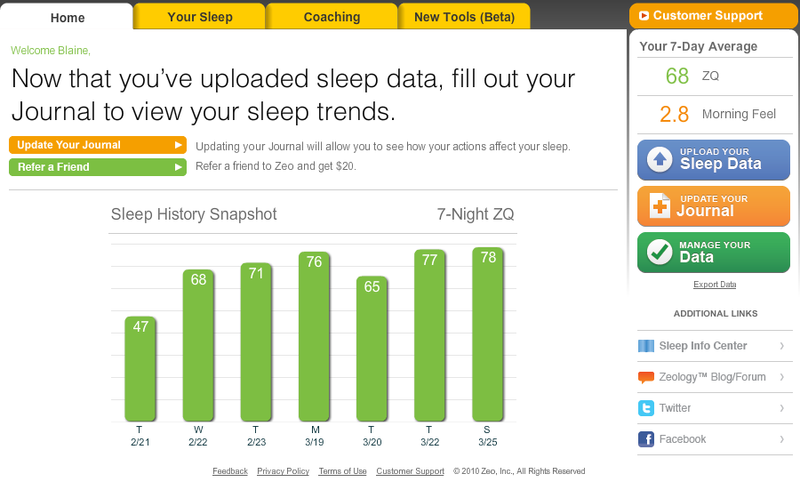 Although WakeMate is subscription free and provides unlimited access to user data on the website (or the app), there is no export function and I have found no way to scape data from the web interface, although their Wakelytics website does have the most comprehensive analysis of the actigraphy data that I have seen compared to other devices. They also allow comparison with the whole Wakemate user base. When I use the device, I often appear in the top 10 and will therefore campaign for sleeping to be entered as an Olympic sport. The WakeMate is less intrusive than the FitBit wrist strap but more tricky to operature as you have to flick a small microswitch, then fire up an app on your phone, make sure Bluetooth is on, then press a button at the right time and the battery only lasts about 2 nights so there is a lot of re-charging involved. It does produce more fine-grained data than the FitBit and is less expensive, but the electronics seem a little unreliable, as mine stopped working after a few months. At time of writing there was no data export facility. This research is concerned with the ways in which Personal Informatics (PI) technologies can be used to influence individuals’ behaviour. In particular it explores the technologies available, the factors which influence their adoption and continued use, and how various data can be compared both within an individual and across a group to help a person achieve his or her goals. PI is a subset of the much older field of lifelogging, a practice that is as old as human beings. From cave paintings to written diaries to family photo albums to blogs, facebook, and flickr people have been manually recording what has been happening in their lives in some kind of durable media. The difference that 21st century technologies have brought is the ability of ordinary people to record automatically and relatively effortlessly a wider range of data about one’s life with a precision and resolution previously only available to elite athletes, scientists and medical staff. These technologies have also provided the ability to store results in a medium that is easily shared, processed, and correlated with other data about the external environment giving people the ability to compare themselves with previous measurements over time or with the current performance of a wider population. While PI is mainly concerned with the technologies for collecting and analyzing data within an individual, PI technologies may also be used to collect data about a group. By utilizing the so-called nudge effect, some people may be guided to modify their behaviour because their performance is regularly compared with that of a group they identify with and they become personally motivated either achieve or exceed the group norm, such as losing weight, using less electricity, or having greener shopping habits. Others may be less motivated by their changing ranking in a group and more so with achieving a personal goal and thus their relative change in performance over time is the key. In this research I will be examining and evaluating appropriate devices for PI across a range of data types. For each device or system I will be looking at factors such as the level of automation and intrusiveness, the quality of the data, and its ability to share data with other PI systems. I will be looking at some of the common goals individuals have and I will explore which devices and methods of influence (personal comparison, group comparison, or combinations) are best suited to helping a person achieve his or her goal. By determining which methods of data collection, analysis, and comparison are best suited to an individual I hope to provide a measurable improvement in how PI technologies may be utilized to help individuals achieve their person improvement goals. While easy to use and automatic, the data produced is only available in the form above. It can be e-mailed as an image or posted on a social network, but the underlying numerical data is not available. Like other smartphone apps using this method, it isn’t true actigraphy and results are highly dependent on the mattress type and whether or not the person sleeps alone. This company (www.greengoose.com) seems to aspire to do more about nudging you to a greener lifestyle, but at the moment the current devices attaches to spokes of your bike whith a wifi device you attach permanently to some network you regularly cycle near. The device automatically uploads your cycling stats whenever it is parked near the wifi device plugged into your network. Although limited in what it records, it is the most automatic of any of the lifelogging technologies I have looked at. While the other sleep monitoring devices rely on the relatively imprecise science of actigraphy, this device uses proprietary technology to apparently monitor brain activity using a simplified form of electroencephagraphy, although this is only a guess. I have attempted to determine if the device is simply measuring heart rate, movement or some other metric by wearing it on my arm instead of my forehead but it didn’t record any data so I have no reason to doubt that it is measuring some kind of brain activity. There are now smaller versions which connect to a smartphone app instead of using a less portable alarm clock, but at between $100 and $200 this is an expensive solution and some users find the headband uncomfortable or difficult to get to sleep with (besides looking a little silly). On the plus side, the manufacturer provides free unlimited access to your own data on their website after you have bought the product and they allow you to export your own data in an open format, so once you have bought the device there are no other costs. On the downside the device isn’t Internet enabled so you have to manually move the SD card and go through an upload process when you want to get at your data. The newer mobile version which connects to a smartphone doesn’t appear to have this limitation but I haven’t evaluated it. I’m also impressed with the way the company seems commited to keeping all the data open and letting people hack it. Brian Schiffler hacked the Zeo to produce real time brain activity data and Zeo hired him as an intern to make the data more open. Formerly known as the Microsoft SenseCam, Microsoft licensed this to Vicon to sell commercially in 2010 as the Vicon Revue. At time of writing this device recorded VGA quality still images at irregular intervals based on an algorithm which responds to onboard sensor data from PIR, light, temperature and movement sensors. Both the history of the sensor data and the images are stored on the onboard flash drive. The device has a mini-USB interface which can be used to access the images on the flash drive as well as charge the built-in battery. The usual method for accessing the images is a highly manual process where the provided proprietary software running on a Windows PC and the device is plugged into the USB bus. The software is activated and it removes all the images and data from the device and copies them into a folder structure on the PC. The proprietary software may then be used to view the images by date/time and to play them for a given date as a kind of slide-show with a variable speed control. Although the provided software is slow, clunky, and only allows access to the image/timestamp data, researchers at Dublin City University’s CLARITY centre have released open source software SenseCam Browser software which can automatically segment the image data, allow labelling, and provide hooks for further research expansion.